Deadwood fans, you waited thirteen years for it and now the day has come. The first teaser for HBO's revival of David Milch's beloved Western series, which was canceled way too early after just three seasons. 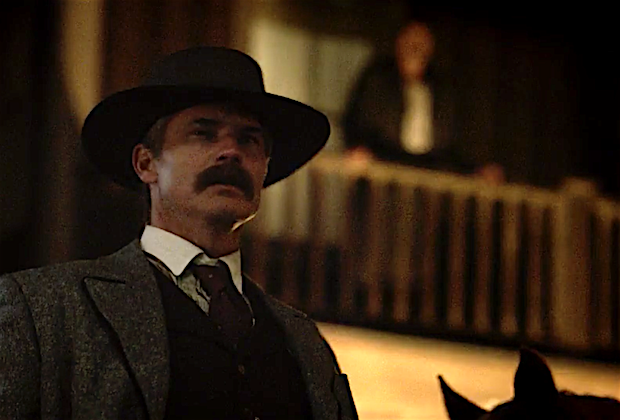 Most of the original cast is back, and of course you know it never would've gone anywhere without Timothy Olyphant as stoic lawman Seth Bullock and Ian McShane as foul-mouthed bar owner Al Swearengen. Here's the official synopsis: The indelible characters of the series are reunited after ten years to celebrate South Dakota’s statehood. Former rivalries are reignited, alliances are tested, and old wounds are reopened, as all are left to navigate the inevitable changes that modernity and time have wrought. Bullock and Swearengen have always had a tenuous relationship, sometimes as outright enemies and occasionally as reluctant partners. While it's hard to tell what's going on in this brief look, they appear to be on opposite sides this time. I think that's exactly how it should be. The Deadwood movie will hopefully tie-up loose ends when HBO premieres it on May 31st.